UPDATE – 15 Mar 2019: Our floor booths are all sold out, but we still have a few mezzanine spaces available. Be sure to contact us if you’re interested! Save the date for the biggest trade show on the Kenai Peninsula with over 140 booths inside and outside the Soldotna Regional Sports Complex. Get ready for a show you don’t want to miss! Brought to you by KPBA and Spenard Builders Supply. With vendors from the lower-48 and all across Alaska, we’re focusing on all things home-related. This year’s theme is “Humble foundations and strong ambitions; the Kenai Peninsula – built upon for decades”. With help from the Kenai Historical Society, we’re highlighting how much the Peninsula has grown with “Then and now” presentation throughout the show. You can also look forward to learning how to prepare your home for your later years, or create a safe space to care for an ailing loved one. We know these are issues that many of us face, so we’ve asked our vendors to bring products and ideas that can be beneficial to us all. Don’t worry about having to leave early if you get hungry; we’ll have food vendors so you can make a day of attending! We’ll also have a “Marketplace” where you can bring the kids for some neat activities, or shop around for your home or business, for friends and family. 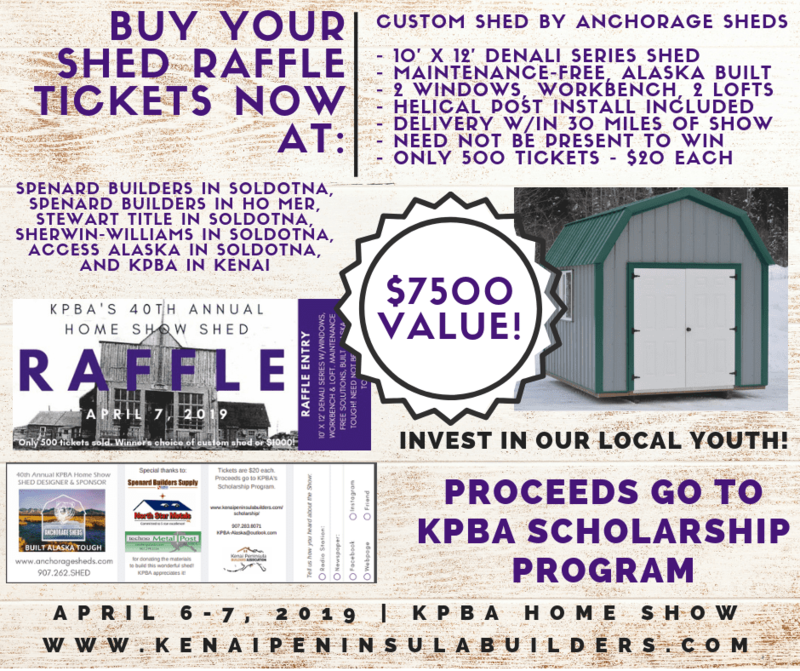 As always, there will be door prize giveaways every 10-minutes, a raffle for a beautiful shed by Anchorage Sheds, and tons more giveaways throughout the entire two-day event. This is one show you don’t want to miss! Are you interested in having a booth, advertisement, or sponsorship for the Home Show? There’s still time to be part of the greatest show on the Kenai Peninsula! We’re down to only Mezzanine booths remaining. Call now and reserve your spot!